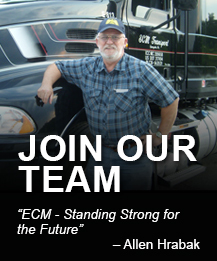 ECM TRANSPORT is a leader in the transportation industry because of our commitment to our customers and recognizing the need to diversify. In addition to our legacy truckload service, ECM initiated an asset based, dry bulk division in 1992 to meet customer demand and expand service capabilities. Today, our pneumatic fleet has grown to include 50 tanks and 20 full time operators, widely regarded as the safest in the business.